Langtang Valley Trek combines a visit to diverse flora and fauna, Buddhist Monasteries, giant white Langtang Range Himalayas including wildlife on the trail such as Musk Deer, Tahr, Snow Leopard, Red Panda, Common Langur, Himalayan Black Bear (depend upon luck), and many other animals. 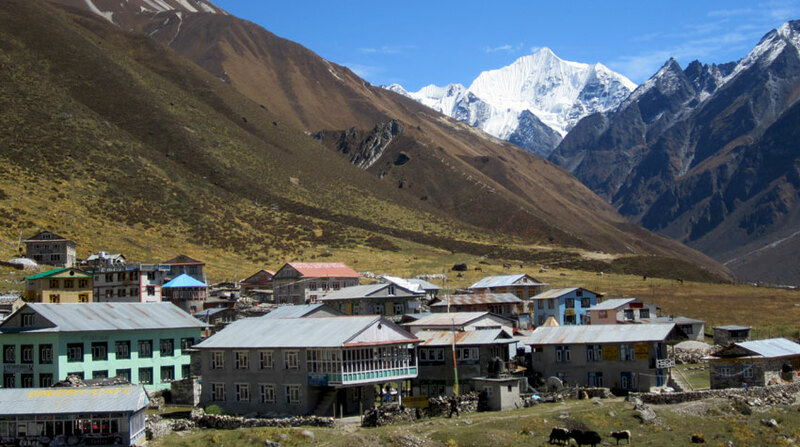 Located 19 miles in distance to the north of the capital city Kathmandu, trekking to Langtang Valley is one of the closest hiking activities that offers panoramic views of snow-capped Langtang Himal. Langtang Valley falls under Langtang National Park, the fourth National Park and the first Himalayan National Park of Nepal. Yak Cheese of this valley is very famous all over Nepal. A tremendous earthquake in April 2015 has totally swiped away the Langtang Village causing hundreds of casualties. Trekking to this area was totally prohibited for several months. After deep researches and surveys of the region, the place was re-opened for the international trekkers and declared as completely safe to visit. Now the village has been recovering from its bitter stage. Several guest houses and lodge has been newly built for backpackers. Langtang Valley Trek begins from Syabrubesi, an 8 hours bus/jeep drive to the north of Kathmandu. The trail passes through the small Tamang Villages, Rhododendron, Oak, Maple, and Pine Forest. After 6/7 hours of walking per day with proper acclimatization, on the second day of the trek, you will reach Langtang Valley. For further mountain observation, the trek reaches up to Kyanjin Gompa. Afterwards, follow back the same trekking route to Kathmandu. Day 01: Drive Kathmandu to Syabru Besi. Trail Attractions: Trisuli Bazaar, Parallel Forest Hills, and Dhunche Bazaar. Day 02: Trek to Lama Hotel. Trail Attractions: Red Pandas, Monkey, Bears (rare case), Bhote Koshi River, Langtang Khola etc. Max. Altitude: 2,380 m (Lama Hotel). Day 03: Trek to Langtang Valley. Trail Attractions: Langtang Lirung Mountain, Ghora Tabela (Horse Stable) etc. Max. Altitude: 3,430 m (Langtang Village). Day 04: Trek to Kyanjing Gompa. Max. Altitude: 3,870 m (Kyanjing). Trail Attractions: visit Monastery, Cheese Factory, Hike to Kyangjin Ri to view Lantang Peaks etc. Max. Altitude: 4,200 m (Kyanjing Ri). Day 06: Trek to Lama Hotel. Day 07: Trek to Syabru Besi. Day 8: Drive back to Kathmandu. Drop to your hotel. Ganja La Pass Trekking finished here! Kathmandu to Syabru Besi by sharing bus/jeep. Twin Bed sharing teahouse/lodge/ accommodation during the trek. Everyday breakfast, lunches, and dinner while on the trek. An English speaking government license holder trekking guide. Langtang National Park Entry Permit. Trekker's Information Management System Permit. Syabru Besi to Kathmandu by sharing a bus. Wants some modification on Langtang Valley Trek itinerary? contact us to customize it.